An ambitious attempt to set a new world record just fell short as eight whisky tastings from Inverness to Brighton were held in one day. Starting in Inverness just after midnight the group travelled to host eight different whisky tastings in eight whisky shops across eight cities between Inverness and Brighton, 643 miles away. Guinness authorities were unable to attend the record attempt to verify it but responded three days afterwards to confirm that it would have been a new world record – had they turned up. The core group which included John Glaser from Compass Box, Andrew Torrance and David Whyte from the Whisky Shop and whisky writer Dominic Roskrow, held eight tastings for more than 130 people in eight Whisky Shops in one long day. “I heard someone talking about the world’s biggest whisky tasting and I felt that it was a record that should be held by Scotland but it wasn’t. I got to thinking and had the idea that if we couldn’t do the biggest we should do the most, so that’s how it developed,” Torrance said. Each tasting had a different theme, but was based around three core Compass Box whiskies – the Great King Street blend, the Peat Monster and The Spice Tree. Travelling by car, the team reached their destination in Brighton at 11.30pm, 30 minutes within their 24 hour deadline. 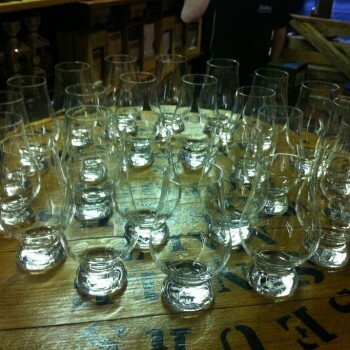 Here is a picture gallery of the 24 hour UK whisky tasting tour.